And then we have another beauty. An eco friendly ring! 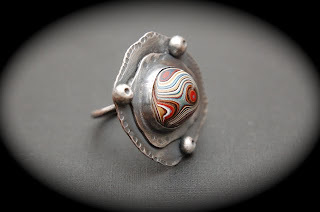 Bezel set Fordite* see story about it below! Will be in the shop tomorrow! 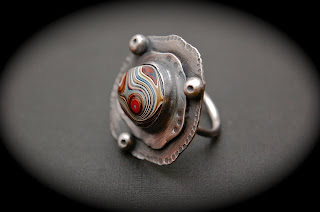 Fordite, also known as Motor Agate, is a unique automotive enamel material with an interesting history. The original layered automotive paint slag "rough" was made incidentally, years ago, by the now extinct practice of hand spray-painting multiples of production cars in big automotive factories.The oversprayed paint in the painting bays gradually built up on the tracks and skids that the car frames were painted on. Over time, many colorful layers built up there. These layers were hardened repeatedly in the ovens that the car bodies went into to cure the paint. Some of these deeper layers were even baked 100 times. Eventually, the paint build-up would become obstructing, or too thick and heavy, and had to be removed. As the story goes, some crafty workers with an eye for beauty realized that this unique byproduct was worth salvaging. 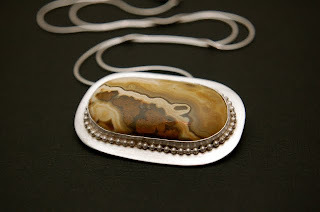 It was super-cured, patterned like psychedelic agate, and could be cut and polished with relative ease! Wow! As word got around about this remarkable material, it's been said that rock hounds started showing up at auto factories, offering to help remove that problematic paint! 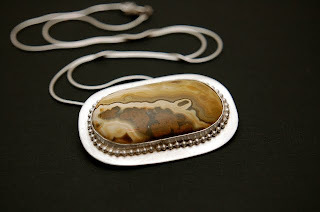 Bezel set Ocean Jasper. I'm in love with this one. The colors are just so organic and earthy. A true gem*. Sadly, the techniques that produced this great rough years ago, are no longer in practice. Cars are now painted by way of an electrostatic process that essentially magnetizes the enamels to the car bodies. This leaves little, or no overspray. 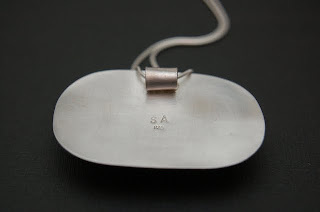 The old factory methods that created this incredible material are long gone. 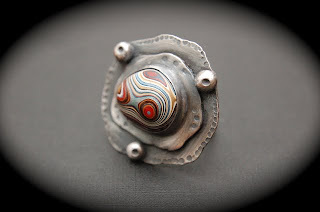 Fordite! I've never heard of it before, but bravo for using it in such a striking piece. Thank you! Merci! Tusen Takk! Gracias!